Today we finally begin in earnest the project we were sent here to do. Our goal is to get a picture of the current state of computer science curriculum in Kurdistan by talking with two computing departments here in Dohuk and advise the Ministry of Education on ways to improve it. After our usual breakfast, honey in the comb every day for me, Dr. Adnan comes by the hotel with a new driver in a BMW sedan. Many of the cars in the hotel lot are Land Cruisers or Corollas. New cars are everywhere. Ms. Amera (one of the computer science faculty) has one and it still has the plastic on the interior and the little foam things on the outside of the doors. Actually this seems to be a common practice as Dr. Adnan’s car is new and has some of the plastic still on it. The new driver is good and fast. He added another driving rule to his list: drive as fast as you can until you come within braking distance of something in the path of the car. Seems to work well for him. Lucky me, I got to ride in the front this time. The morning meetings went from 9-12:30 or so with a break in the middle for tea. We cannot go without tea for more than a few hours. I wonder if this is left over from the British? I’ll have to ask. 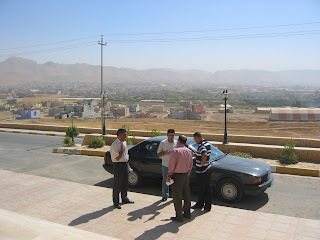 By the way, Dohuk city is actually fairly young in Middle East terms, only 300 years or so years old according to Dr. Adnan, and he should know as his ancestors were among the founders of the city, coming out of Turkey to settle the region. Got to eat some new cookies, one completely covered in sesame seeds. Not bad, but I would prefer one of Margaret’s whole wheat oatmeal chocolate chip. The initial meeting went well after I realized I was supposed to be leading it. Got some good information, again relying on much talking and translating among the attendees and me choosing words more carefully to make it easier for them to understand me. The meeting ended and thus ended the bulk of our work for the day. Lunch. I will not repeat what we had for lunch. If you have been following this blog, you can tell me what I had for lunch. The most interesting story of the day began to develop a little while earlier just before lunch when the schedule for the rest of the day was being discussed. Don’t know if I said it already or not, but around here schedules are flexible or fluid might be a better word. Just in time planning. Since my life back home on the farm and at ASU has been operating like this for about 5 years, it doesn’t bother me and makes me feel right at home. In passing Rahman mentioned that he liked football and that he usually played three times a week and that his neck was sore because he had not been able to play. One of the teaching assistants named Ari(note that these assistants have completed their undergraduate degree in computer science and are required to teach for two years as an assistant in the labs before they can start the masters program) asked Rahman if he wanted to play while he was in Duhok. Of course Rahman said yes, he cannot say no, and that I used to play with him on a team. With about 5minutes of cell phone calls and vigorous discussion with Dr. Adnan, it was announced that we would play soccer that evening with the students and then have dinner. The plan: students pick us up at 8:30pm, play soccer 9-10pm, eat, return to hotel, blog/chat, collapse. Rahman and I decided to fill the afternoon and early evening schedule with some work, a nap, the pool, and more work to prepare for tomorrow’s meetings. The nap was easy given the full stomach and staying up until 2am the night before chatting with my wife. The pool was very nice too. The water felt cool today and with the breeze (anyone want to invest in wind energy here?) it was actually chilly when leaving the pool. Remember the figs by the pool? We were sitting on the end of the pool with a good view of the fig tree below in the garden. It turns out that one of the hotel staff knew the tree was there and that the figs were getting ripe. We were watching him try to reach some when a couple of other gentlemen walked up, one dressed in army fatigues with a Kalashnikov (also known as AK-47) over his shoulder. Seeing a ripe fig a little higher in the tree, Rahman and I began pointing to it while the hotel staff climbed the tree. The AK-47 fellow saw it, sat his rifle down, picked it, came over to the wall and tossed it up to Rahman. Then he went back and got me one. Never thought I would eat a fig in Northern Iraq from a Kalashnikov wielding man. We ate several more figs as they tossed them to us. Now for the adventure. Naive or trusting? Could be a theme. Get in a small car at 8:30 at night with some Kurdish students we met for the first time that morning, travel about 30 minutes north over some really bad roads with big trucks and dust everywhere and few street lights, turn up a side street, stop at an enclosed soccer field with lots of little kids running around, play soccer for an hour, get back in the car, return to Dohuk, eat Domer kebab on the street again, return to the hotel at 11:30. At one very busy intersection along the way we turned right onto a big highway to get to Somer, the location of the soccer match. Turning left would take us to Mosul which everyone says is definitely not safe. Years before Amera and Basima both moved from Mosul to Dohuk. The soccer match was a lot of fun and felt completely safe. Everyone here is very welcoming and very generous. Amera and Basima have offered our families a stay in their houses if I were to bring them. I still had occasional random bad thoughts based on movies or news reports, but I was able to ignore them. 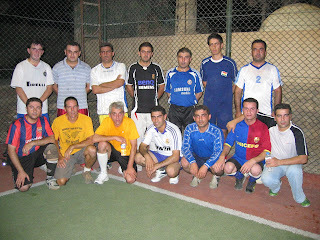 Ari had arranged the match by reserving the field and getting enough of his friends to come out and play. The field was like the one I mentioned seeing in Zawita, totally enclosed with mesh over a high fence with an artificial turf surface. I have rug burns on my knees and can hardly walk from soreness. Little boys were scattered about the perimeter of the field with coolers of bottled water, offering it to us each break. Rahman scored a goal. I didn’t. We lost 6-5. Following the match, Ari pointed out his house just up the street. A very nice looking house by the standards I had seen. Ari is one of ten children, the youngest boy. He just finished his undergraduate degree in computer science and wants to pursue his masters degree to become a teacher. His father was a teacher, the first one in Somer. The trip back to town was briefly interuppted when we tried to turn left to get to another road and some bigs rocks in the median began to scrape the nice new underside of the car. We backed up, scraping in the other direction. I was hoping we were not going to stay stuck. Finally, continuing down the road we made our way to town, found a nice little restaurant like the other two we have eaten in, and had a nice meal with the soccer gang. The day ended like all of the others.